A fire that swept through a crowded nightclub in southern Brazil early Sunday and killed 232 people appears to be the deadliest in more a decade. A blaze at the Lame Horse nightclub in Perm, Russia, broke out in December 2009, when an indoor fireworks display ignited a plastic ceiling decorated with branches, killing 152. A December 2004 fire killed 194 people at an overcrowded working-class nightclub in Buenos Aires, Argentina, after a flare ignited ceiling foam. A nightclub fire in the U.S. state of Rhode Island in 2003 killed 100 people after pyrotechnics used as a stage prop by the 1980s rock band Great White set ablaze cheap soundproofing foam on the walls and ceiling. In China's worst nightclub disaster in recent years, a fire blamed on a welding accident tore through a disco in the central city of Luoyang in December 2000, killing 309 people. A fire at the Ozone Disco Pub in 1996 in Quezon City, Philippines, killed 162 people, many of them students celebrating the end of the school year. In 1977, 165 people perished and more than 200 were injured when the Beverly Hills Supper Club in Southgate, Kentucky, which touted itself as the Showplace of the Nation, burned to the ground. 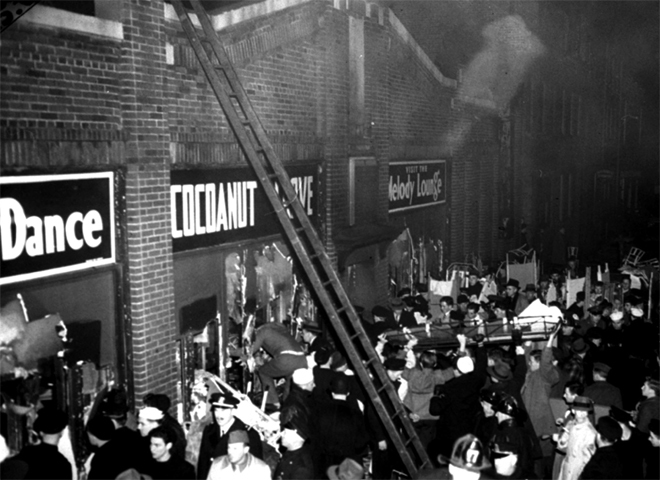 A fire killed 492 people at Boston's Cocoanut Grove club in 1942, the deadliest nightclub blaze in U.S. history. The fire led to the enactment of requirements for sprinkler systems and accessible exits with emergency lights not linked to the regular lighting system. In 1940, a fire ignited the decorative Spanish moss draping the ceiling of the Rhythm Night Club in Natchez, Mississippi, killing 209 people. Hundreds of patrons ran to the only exit. The windows had been boarded shut to keep unwanted guests from sneaking in.